“There’s More!” was four huge days and nights of open house street art, music, indie films, live painting, paste-ups, stickers and there’s more. I got along to see it on Saturday afternoon. On Friday night I had tried the watching the live streamed video but I couldn’t see more than a DJ and a few people and the stream kept stopping so it wasn’t worth listening to. There were plenty of legal walls to paint in the lanes around Cocoa Jackson Studio and a few grey areas. 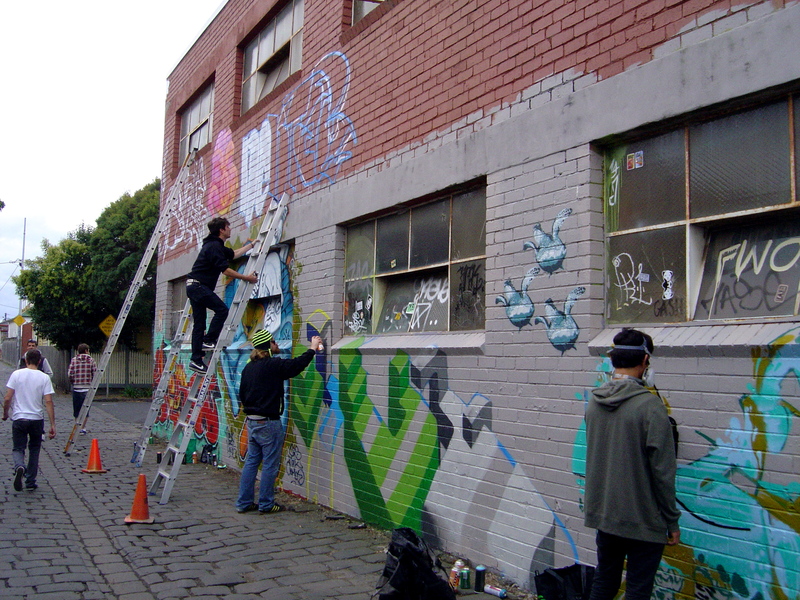 And it wasn’t just around Cocoa Jackson Studios for a few blocks up Lygon St. there were more artists painting with more walls in lanes around Ann Street thanks to Dean Sunshine. There were plenty of artists, to many to count. 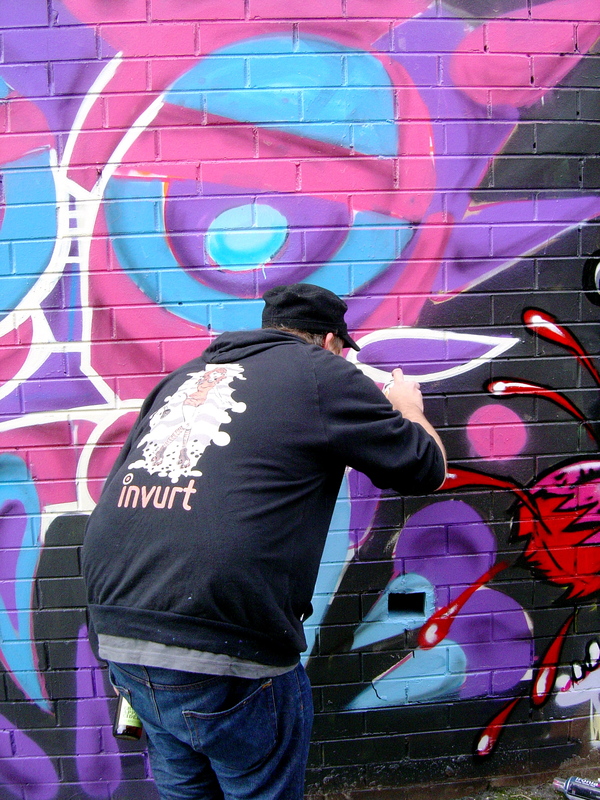 There were artists from around the world, travelling artists from as far away as Barcelona painting walls. Even though Melbourne’s weather was threatening rain there were lots of people watching and photographing the event. Watching people paint can be both fascinating and as dull as watching paint dry. But I did get distracted watching Slicer and Deams paint (I made a short movie of Slicer painting). I was reminding myself that it could be like watching Jackson Pollock painting. And I ended up missing Bandos Earthling’s first gig at Cocoa Jackson but there was so much happening. So many people to catch up with – Civil, Junky Projects, Fletch, Phoenix, Bandos Earthling, art collector Andrew King was wandering around offering people beers and I’m forgetting some others – I’m sorry to anyone I’ve forgotten to mention. So much aerosol paint that the weeds are covered in paint. 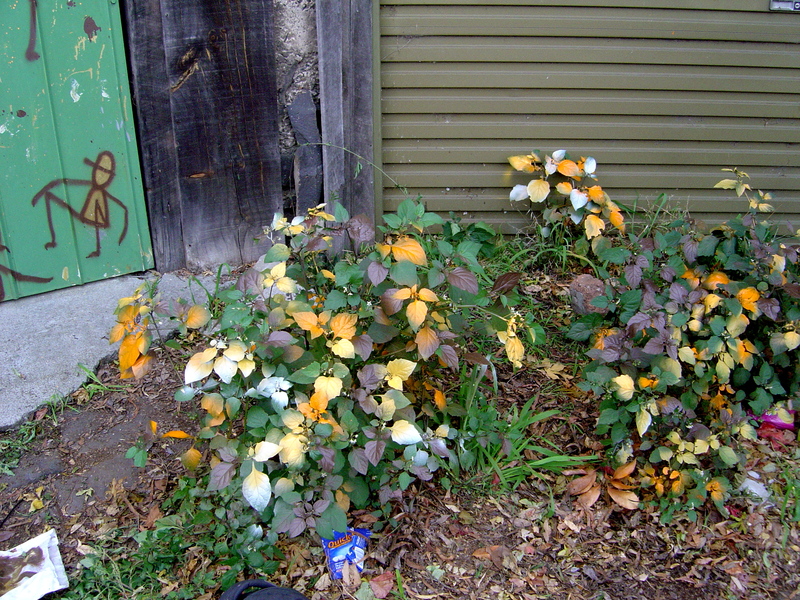 Down the laneway Civil was spraying the belladonna leaves autumnal colours. The main space of Cocoa Jackson Studios was filled with a large group exhibition along with panels of stickers for sale by silent auction. 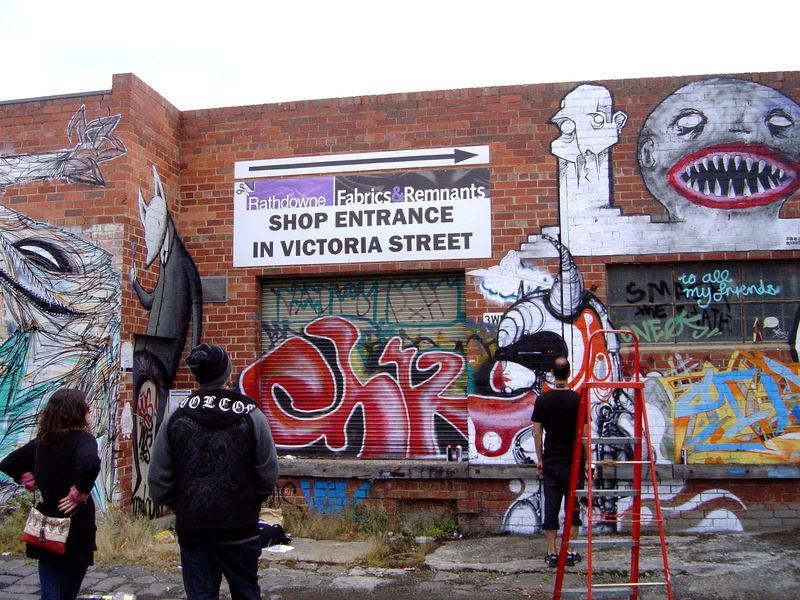 There was plenty of new work by Junky Projects along with many other artists that I recognize for Melbourne’s streets. It was great to have an event like this close to home rather than in distant suburbs. On my way home I passed more artists painting another wall on the other side of Brunswick, so every graff artist in Melbourne wasn’t painting in the lanes around Cocoa Jackson Studios and the Land of Sunshine. 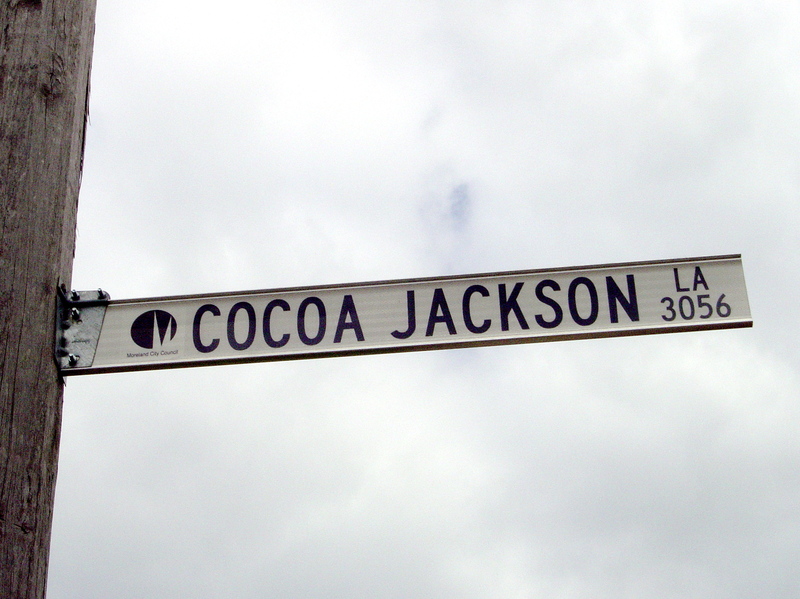 For readers wondering about the unusual laneway name: Cocoa Jackson Lane is named after Australian feather weight boxer Peter Jackson. The exact reason why there is a lane in Melbourne named after him remains a mystery although Peter Jackson did have several fights in Melbourne in 1930 – 1931. 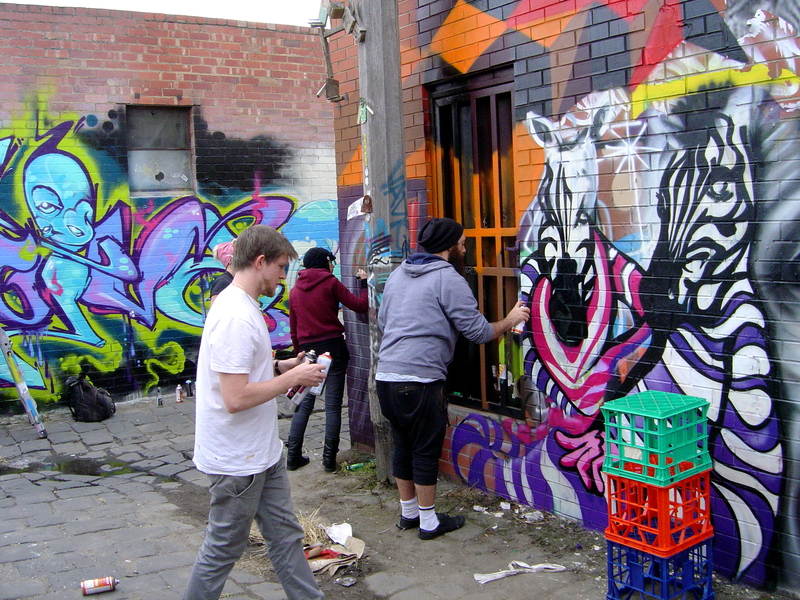 This entry was posted on Saturday, March 24th, 2012 at 11:10 PM	and tagged with AWOL, Brunswick, graffiti, Junky Projects, Slicer, Tom Civil and posted in Street Art. You can follow any responses to this entry through the RSS 2.0 feed. This is awesome! Must time my next Melbourne visit to coincide with something like this. I love the lane ways, its almost like another hidden city within the city! We had the stream on for a little while on Friday night, and we did put up a notice whenever it wasnt online, we also had the lvie blog running for a lot of it so if the stream was down people could still follow what was going on via that. Unfortunately, as Friday night was the film night, and as we did not have re-broadcast rights to the films on show, we couldnt stream much of it. We also ran into a few battery issues here and there, so it was far from 100% perfect – we did get viewers from all around the world, however! It was worth trying out for your experience and I was also happy trying it out at my end. The Ivie was a good addition to the experience. I wanted to note the tech and online side of the event – I should have also mentioned the Facebook event page and Facebook invites (thanks Junky Projects).